Centricity™ Electronic Medical Record (EMR) offers physician offices a comprehensive ambulatory EMR, Population Health, Patient Engagement, Analytics, and Connectivity solution that integrates well with your revenue cycle management and practice management solutions. Now physicians and their support staff can devote more time to treating patients with efficient online access to patient records. Backed by 30 years of experience, GE Healthcare's Centricity EMR solution is designed to help you enhance the clinical productivity of your ambulatory practice. Few practices have what they need to succeed in these changing healthcare times. GE Healthcare’s innovation is combining the tools you need into a single solution. GE Healthcare enables practices to tailor the solution to your unique workflow and preferences, enabling you to practice medicine more effectively in the way you prefer. Centricity EMR improves collaboration by enabling you to share data with existing clinical or financial systems across the healthcare ecosystem, connecting when, where, and how you need it to. Centricity EMR’s time saving features like customizable workflow automation help your providers get back to what you do best – practicing medicine. Learn how to implement care coordination into ambulatory care settings to improve outcomes and better control costs in chronic disease patient populations. Learn how seamless integration of clinical data from other settings into the provider workflow can help enhance care quality, can reduce total medical expense, and can save providers an hour per day in chart reviews. Centricity EMR EMPA helps increase efficiency by reducing the time your practice spends on medication prior authorizations and helps enhance care quality by expediting the approval process for patients. The USOC implemented GE Healthcare's related EMR product, Centricity Practice Solution, to help elevate Team USA’s performance. How Does the Practice Management (PM) Module Help Strengthen Financial Performance? Centricity™ EMR is an interoperable EMR system that enables connection to your preferred practice management system. GE Healthcare also offers a fully integrated EMR and Practice Management system, Centricity Practice Solution. The Centricity Practice Solution PM module helps you streamline your billing workflow and patient management processes to achieve a more productive practice. When used with Hosted Claims Manager and A/R Accelerator, Centricity Practice Solution can further aid the process of improving business productivity and increasing revenue cycle efficiencies. Case Study 1 - How Children's Orthopaedic and Scoliosis Surgery Associates LLC accelerated payments by 22%. Case Study 2 - How Kansas City Bone & Joint Clinic's usage of Centricity Practice Solution helps boost patient throughput by almost 25%. Case Study 3 - How Centricity Practice Solution helps Virginia Women's Center streamline workflow, enhance patient care, and increase profitability by 19%. Case Study 4 - How Ortho Northeast made simple workflow adjustments that dramatically reduced cycle times and avoided $800,000 in construction costs. A flexible, customizable scheduling interface that gives users a real-time view of their daily schedule, enabling a seamless patient experience. A high-level view of financial metrics based on MGMA key performance indicators, enabling easy access to timely and accurate information. Critical account information all in one place, helping your staff save time and improve communication with guarantors. A/R Accelerator automates and streamlines features such as patient intake process, appointment eligibility, remittance & denial management, and claims & insurance management. Furthermore, convenient task management and reports make it easy to track staff productivity. How Does The Electronic Medical Record (EMR) Module help you deliver and document informed care? Centricity™ Electronic Medical Record (EMR) offers secure clinical records storage, so you can capture, store, and transmit essential patient data. Quick data entry methods and at-a-glance access to patient information puts everything right where you need it. Centricity EMR v12.3 is a certified ONC 2015 Edition EHR. Case Study 1 - How the United States Olympic Committee (USOC) implemented Centricity Practice Solution starting at the 2012 London Olympic Games. Case Study 3 - How Centricity Practice Solution helped Virginia Women's Center boost profitability by 19%, streamline workflow, and enhance patient care. White Paper - Seamless integration of clinical data from hospitals is a key to success in value-based care - and can save providers an hour a day. A simple, intuitive interface that lets users quickly navigate through the patient chart with easy access to documents and data. An at-a-glance view of everything needed for an understanding of the patient prior to the visit. Save providers an estimated hour per day on chart reviews by bringing external data into the workflow. Our streamlined workflow simplifies documentation of the appropriate diagnosis. Search results are ranked by frequency of use by the user. A variety of data-entry methods including voice, templates, and quick text for ease of use and time saving. Designed to work the way you do to help improve effectiveness and efficiency, and enable more informed clinical decision-making. Tools for robust, efficient, streamlined medication order entry. Tools and services to help your practice track, measure, and report your care quality outcomes. Centricity EMR is a comprehensive EMR, Practice Management, Population Health, and Analytics system that helps practices excel in MIPS and other value-based care payment models by helping practices more efficiently deliver informed care, coordinate care across teams and care settings, and reduce patients' overall medical expense. Centricity EMR can help enhance quality measure performance. It can automatically track key quality metrics and for certain measures can provide clinical decision support that makes it easier to deliver high-quality care during patient visits. Centricity EMR helps guide practices with tools to satisfy base measure requirements and meet goals for 2017 performance measures. A dashboard helps track performance for practices' chosen MIPS objectives and measures. Centricity EMR can help you meet a number of IA measures. Centricity Practice Solution makes it easy to automatically import and exchange data with different sources, including patient portals and registries, creating alerts and notifications, and providing access to pre-designed and custom forms and surveys. And pre-validation for NCQA PCMH 2017 helps existing customers achieve full credit for the IA category. This category doesn't require data submission and it will not count toward MIPS composite scores in 2017. At GE Healthcare, customers determine our success. We provide access at no additional cost to resources like the QPP Quality Reporting Guide, our online Quality Reporting Community, and both live and on-demand webinars that describe how to succeed with MIPS overall and within each measure. 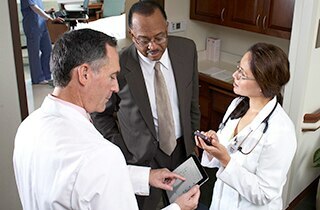 GE Healthcare offers additional services4 where consultants can also help improve your performance and payment outcomes. Contact us to learn how we can help you succeed with MACRA. Centricity EMR Version 12.x is PCMH pre-validated by NCQA to receive auto-credit toward NCQA's PCMH 2017 scoring, reducing your administrative burden of attaining PCMH 2017 recognition. Case Study - For Ammonoosuc Community Health Services, an Electronic Medical Record proves essential in delivering award-winning care and achieving Level 3 recognition as a patient-centered medical home. Centricity EMR offers online patient portal, secure remote clinician-patient messaging, summaries and patient reminders. Centricity EMR provides collaboration tools that enable providers to exchange clinical information and coordinate care in real time and to deliver evidence-based care using guidelines to generate lists and remind patients about needed services (preventive, check-up, medications, etc.). Centricity EMR provides powerful reporting on structured data, helps providers adapt workflows and add point-of-care reminders, and displays quality metrics through quality dashboards. Your orthopedic practice is under pressure like never before, with decreasing reimbursements and the shift to value-based care leading the growing list of challenges. Centricity EMR is an EMR system that helps you manage these issues throughout the patient and provider experience to enhance your clinical performance. Case Study 1 - How Kansas City Bone & Joint Clinic's usage of Centricity Practice Solution helps boost patient throughput by almost 25%. Case Study 2 - How Children's Orthopaedic and Scoliosis Surgery Associates LLC is maximizing the value of Centricity Practice Solution. Struggling to keep up with growing regulatory and payer documentation requirements? Starting with rich orthopedic content that's sustainably customizable, Centricity EMR's productivity tools like SimpleChart help automate data entry and documentation so you can quickly chart in your own personalized way while still meeting requirements. Caring for patients is at the heart of what you do. Centricity EMR has tools to help you keep focused on patients during the visit and stay connected with them beyond the office. It also helps you collaborate with providers in other care settings to streamline follow up and education. The shift to value-based care isn't a matter of when - but how. We're committed to helping your practice transform with our comprehensive Merit-based Incentive Payment System (MIPS) solution. Centricity EMR includes dashboards that help you monitor and predict performance as well as in-depth educational resources. We can work with you directly to help your practice understand what it takes to succeed. Spending meaningful time with the patients who need you the most. It’s what you desire and what your patients expect. However, practicing medicine is now complicated by evolving delivery and payment models and burdened by a complex web of ever-changing documentation and regulatory requirements. Hindered by disconnected, inefficient, and inflexible systems, providers and staff are burning out. Our population health solution gives visibility to all patients by risk profile so you can make sure your patients engage in the care they need and optimize the value of the care you deliver. The goal is to help boost the quality of care at your facility, improve profitability and leave your patients feeling satisfied with the one-on-one interaction they’ve come to expect. By delivering informed care more efficiently than with an EMR alone, you can more effectively build your business and enjoy practicing again. Thriving in today’s healthcare environment means finding new methods to coordinate your team for more efficient care delivery. It requires finding ways to focus your practice’s limited resources where they will have the greatest impact. It demands thorough care delivery that consistently adheres to evidence-based guidelines and closes gaps in care. Prioritize patients for intervention - Easily visualize patients with gaps in care and group them with others who share similar health issues and prioritize groups for intervention. Efficiently manage populations - Develop condition-specific care plans, apply them to the appropriate population, and efficiently manage activities for the entire group. Coordinate across the care team - Role-based workflows enable more efficient execution of patient specific care plans and easy collaboration with other members of the care team. Deliver thorough, consistent care - Point-of-care decision support, incorporating data and evidence-based guidelines, helps you consistently close gaps in care during the visit. Capture value-based payments - Optional pre-defined programs help deliver success in chronic care management and transitional care management. Amid industry upheaval, healthcare organizations are under greater pressure than ever to be productive. Only by getting the most out of every tool can you deliver the care patients need with the efficiency the market demands. GE Healthcare's IT Services are designed to connect productivity with care by increasing usability, enhancing performance, and optimizing a solution's return on investment. Increases employee and IT system productivity with Workflow Consulting, Regulatory Consulting, Technical Consulting, or Productivity Assessment. Drives understanding and increases adoption by leaders and staff through Master Trainer Education and/or End User Education services. Delivers high adoption right from the start with Software Implementation, Upgrade Implementation, or Data Migration services. Reduces unplanned downtime, promotes resilience, and enhances usability throughout your IT systems lifecycle with Software Maintenance and Dedicated Support services. Diminishes disruptions, responds to required changes, and optimizes productivity through Application Customization, Interface Customization, Report Customization, or Custom Integration services. Reduces uncertainty and long-term expenses while staying focused on your organization's patient care mission through Asset Management, Remote Monitoring, or Business Continuity services. Some services may not be available for specific products. GE Healthcare partners with knowledgeable and experienced value-added resellers to understand your needs and provide an exceptional solution to address those needs. We know that we cannot drive outcomes on our own, which is why our ecosystem is more than 100 partners strong. GE Healthcare IT has active relationships with consultants, system integrators, resellers, hardware and software companies, and third-party content providers across our entire portfolio. We are continuously expanding our ecosystem to help us deliver the best solutions for our customers. Industry Knowledge Center to learn about these trends and follow our thought leaders. Share your experiences and expertise to promote your unique accomplishments and help similar organizations make informed business decisions. We are dedicated to supporting our customers in their goal to improve patient care and advance the healthcare industry. By participating in the Centricity STAR Program, you will have the opportunity to showcase your innovative use of technology to a larger audience of peers, practitioners, patients and the greater healthcare industry. > Learn more about our reference program and nominate your organization today! Centricity Practice Solution v. 12.3 EHR Module and Centricity EMR v. 9.12 are ONC 2015 Edition compliant and have been certified by Drummond Group in accordance with certifiable action criteria. For additional certification and transparency information, visit www.gehealthcare.com/certifications. Our innovation is combining tools for comprehensive care delivery, financial management, population health, patient engagement, analytics, and connectivity into a single solution specifically for CHCs. Centricity Practice Solution v. 12.3 EHR Module is ONC 2015 Edition compliant and has been certified by Drummond Group in accordance with certifiable action criteria. For additional certification and transparency information, visit www.gehealthcare.com/certifications. GE Healthcare's Centricity Practice Solution Version 12.x is PCMH prevalidated by NCQA to receive autocredit toward NCQA's PCMH 2017 scoring. Large multispecialty practice, Million Hearts Webinar. Quality performance of health system’s in-network primary care clinics vs. peers in CPCi program within Midwestern region. Improvement attributed to team-based care delivery model and population health capabilities.